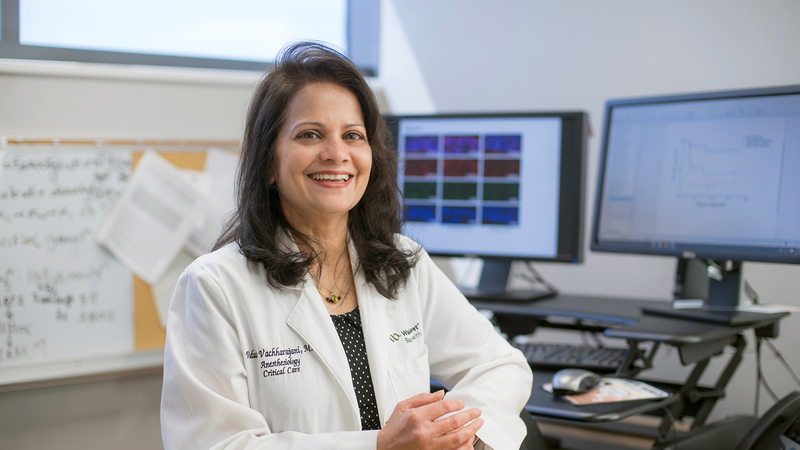 Vidula Tushar Vachharajani, MD, is a basic science critical-care physician investigator studying the effect of obesity on sepsis and microvascular inflammation, with specific interest in the role of sirtuin nutrient sensors in late-phase disease. Her partnerships focus on strategies to target sirtuin expression in dysregulated infection response, with the goal of developing effective therapies to reduce immune dysfunction and mortality associated with sepsis. in Mumbai, India and completed residency and fellowship training in India and the United Kingdom. In 1990, she moved to the United States to attend Louisiana State University Health Sciences Center, where she completed an internal medicine residency and critical-care medicine fellowship. During this training, Vachharajani conducted basic science research exploring the impact of obesity on early sepsis—an interest that has continued throughout her career and expanded to the study of late sepsis. After five years as a critical-care physician at Louisiana State University Health Sciences Center, she joined Wake Forest School of Medicine’s departments of critical care and anesthesiology in 2006 to continue sepsis-related research. A practicing critical-care physician, Vachharajani’s focus on cardiovascular critical care extends to studying the effect of obesity on microvascular inflammation in both early and late sepsis. With funding for more than eight years from the National Institutes of Health, she uses obese and lean murine models of sepsis to study the role of sirtuin nutrient sensors in disease progression and inflammatory response. Through several techniques, including microvasculature adhesion, gene and protein expression, and cell-culture models, she examines how altering different sirtuin inhibitors reduces late-stage immunosuppression and infection clearance in the small intestine and increases survival. She also evaluates the impact of nutrition and oxidative stress on sirtuins and inflammatory immunosuppression in sepsis. As co-director of the Critical Illness, Injury and Recovery Research Center at Wake Forest School of Medicine, Vachharajani collaborates with a multidisciplinary team of critical-care physician investigators to oversee clinical and basic science research efforts related to critical illness and injury. She also has capability for industry partnership involvement, with specific expertise in examining sepsis-related inflammation and response, infection clearance, and therapeutic efficacy in preclinical animal models of early and late sepsis.